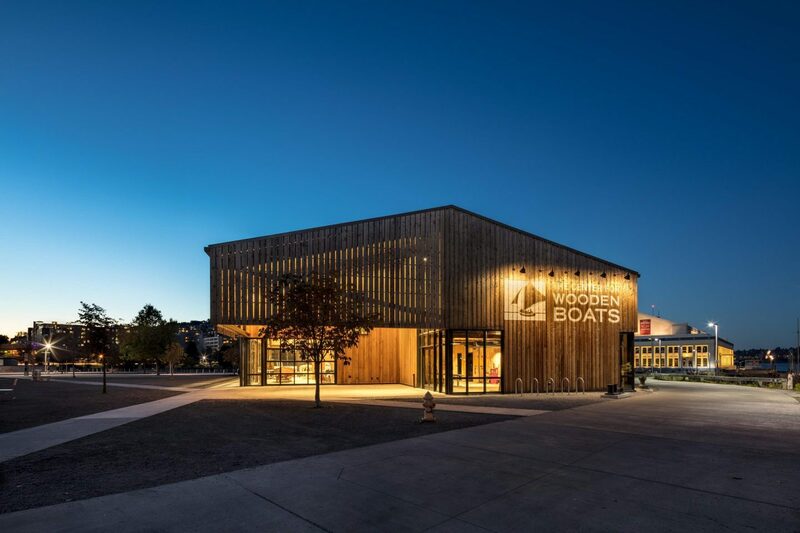 After more than four decades of operating from its small boathouse on the shores of South Lake Union, The Center for Wooden Boats is expanding with its new Wagner Education Center designed by Tom Kundig, FAIA, RIBA. On March 23 and 24, CWB will celebrate the new facility’s grand opening with exhibits, family activities and free boat rides for the community. A ribbon cutting ceremony will take place at 10:00 am on March 23. Carefully sited to fit within Lake Union Park, the Wagner Education Center establishes a more visible public face for CWB and will allow the maritime museum to offer more programs and classes, preserve more boats and host larger events. The center’s design was inspired by the wooden boats housed within: it is a functional, straightforward building that serves as an armature for the CWB’s activities. Designed for passive cooling – the building has no air conditioning – the occupants interact with it as they would a boat. A movable exterior shade system and operable windows and skylights allow users to tune the building, working with natural forces to optimize performance. In design and operation, the building is a direct response to CWB’s mission: a hands-on community gathering space for people of all ages to grow, learn and connect with the environment. For more information on grand opening events, please visit http://cwb.org/events/.